Political culture; United States; History; 18th century. Protest movements; United States; History; 18th century. Political participation; United States; History; 18th century. Amazon.com description: Product Description: Commons Democracy highlights a poorly understood dimension of democracy in the early United States. It tells a story that, like the familiar one, begins in the Revolutionary era. 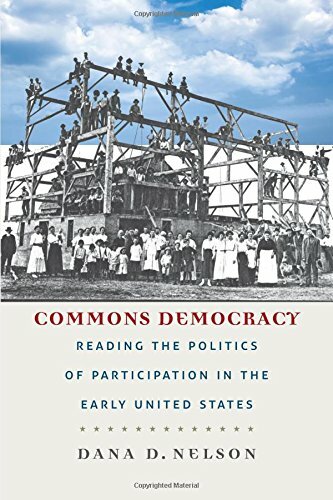 But instead of the tale of the Founders' high-minded ideals and their careful crafting of the safe framework for democracy--a representative republican government--Commons Democracy examines the power of the democratic spirit, the ideals and practices of everyday people in the early nation. As Dana D. Nelson reveals in this illuminating work, the sensibility of participatory democratic activity fueled the involvement of ordinary folk in resistance, revolution, state constitution-making, and early national civic dissent. The rich variety of commoning customs and practices in the late colonies offered non-elite actors a tangible and durable relationship to democratic power, one significantly different from the representative democracy that would be institutionalized by the Framers in 1787. This democracy understood political power and liberties as communal, not individual. Ordinary folk practiced a democracy that was robustly participatory and insistently local. To help tell this story, Nelson turns to early American authors--Hugh Henry Brackenridge, James Fenimore Cooper, Robert Montgomery Bird, and Caroline Kirkland--who were engaged with conflicts that emerged from competing ideals of democracy in the early republic, such as the Whiskey Rebellion and the Anti-Rent War as well as the enclosure of the legal commons, anxieties about popular suffrage, and practices of frontier equalitarianism. While Commons Democracy is about the capture of "democracy" for the official purposes of state consolidation and expansion, it is also a story about the ongoing (if occluded) vitality of commons democracy, of its power as part of our shared democratic history and its usefulness in the contemporary toolkit of citizenship. About: Commons Democracy highlights a poorly understood dimension of democracy in the early United States.